Last night was the monthly meeting of my writer’s group, and one of the ladies introduced us to something none of us had ever experienced: Mochi ice cream. It was delightful, and once I googled it, I found out how incredibly easy it is to make, so I will definitely be attempting that once summer arrives. But I really found it interesting how differently I reacted to tasting this new food, compared to the other ladies. I’ve noticed this before: I am a supremely sensual/tactile person; I haven’t “seen” something until I have touched it, and while certain noises (like nails on a blackboard) drive other people crazy, sounds don’t bother me. It’s certain touches that set my teeth on edge: I cannot, for instance, take the cotton out of a medicine bottle with my bare hands. Even thinking about doing that makes me cringe. I am all about the touch. Other people don’t seem to notice most of this, but they do notice how I eat (maybe because of the general touchiness about weight/eating disorders/obesity that we have in the States.) They notice that I take longer to eat than they do, and that I seem to eat less (and I use the word ‘seem’ because they don’t see how I’m constantly eating, all day long. I don’t confine myself to three meals a day – I think I have Hobbit blood in me). The reason for both those things is simple: I am tactile, and I savor my food the same way I savor everything good in life. I don’t understand how people can just pop something in their mouths, chew it up, and swallow it down. How can they truly enjoy something that takes them seconds to consume? 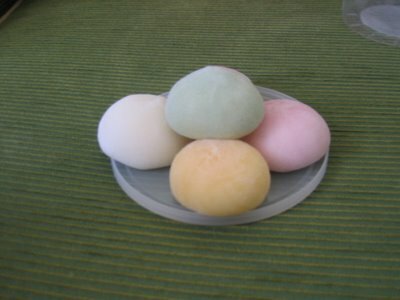 When I ate my first Mochi, I wanted to do more than just taste it. I wanted to see how the rice coating felt against my tongue, and how it turned from stiff and cold and powdery, to soft and sticky and sweet. I wanted to test the texture of the ice cream as it melted, and how the different stages of rice coating and ice cream melded together and made a constantly changing array of sensation. I wanted to see how it felt to lick it, to bite it, to roll it inside my mouth and let it become ephemeral as it melted away. I could have spent three times as long as I did, eating that first Mochi. I eat everything the same way. A handful of M&Ms take me half an hour to eat, because it would be such a waste not to play with them, to discover how many different ways there are of eating an M&M. My current favorite is to hold two under my tongue until that perfect moment when the chocolate inside is melted, but the candy coating is still hard. Then I break each one apart in a lovely soft crunch and splash of warm chocolate. This world delights me too much not to take my time with every moment…even things as everyday as eating. This entry was posted in Life and tagged ice cream, mochi, playing with your food, savoring food, sensual, tactile. Bookmark the permalink.